Q-See - QTH8077BA - 1080P Auto Focus Analog Bullet Camera - 80 ft Night Vision - 1920 x 1080 - 2.80 mm - 12 mm - 4.3x Optical - CMOS - Cable - Bullet - Ceiling Mount, Wall Mount"
See more and know more with this 1080P Auto Focus ANALOG HD Bullet Security Camera from Q-See. In addition to the high definition, the QTH8077BA features a durable weatherproof housing with an IP66 rating to keep out dust and water. 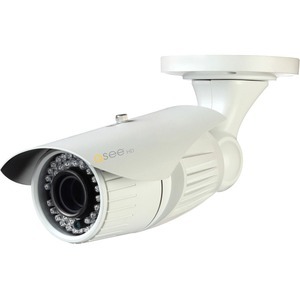 The infrared LEDs give 150 feet of infrared night vision to let the camera keep watch through the night as easily as through the day. Whether you're protecting the front office or the back yard, this camera is built to help you see more of what matters most.